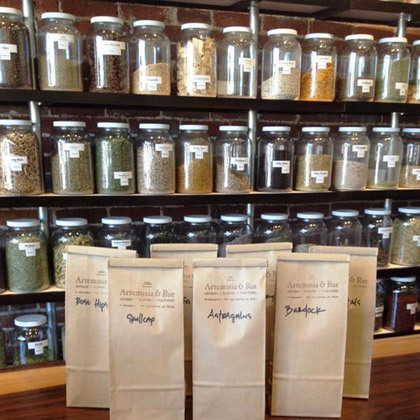 Teas are our favorite herbal preparation! They are a gentle introduction to healing plants and form the foundation of herbal self-care, as they work in a gradual and comforting manner. Simply taking the time during our daily routines to brew and drink tea helps to restore the essence and power of nurturing ourselves! 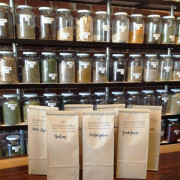 A medicinal tea is a temporary water extract of an herb and must be made daily to ensure freshness and quality. Preparation of medicinal teas differ from that of beverage teas (such as earl grey) in that they are steeped for much longer and that the plant material must be free-floating versus being bound up in a tea bag or tea ball. Teas must be steeped for a minimum of 20 minutes, best overnight for nutritive teas! The easiest way to prepare a medicinal tea is by making a quart at a time in a French tea press or tea pot, but can also be made in a pot on the stove or in a glass mason jar. INFUSION – involves steeping the herb in recently boiled water. This is used for more fragile parts of the plant (i.e.. leaves and flowers). • boil water- turn off the heat. Add 4-6 Tbsp. of herb/tea blend to bottom of tea press. • let steep covered at least 20 minutes. strain and drink, refrigerate remaining portion and reheat as necessary. COLD INFUSION – similar to an infusion, but cold water is used during the steeping process instead. Our favorite and most frequently recommend cold infusion herb is Marshmallow Root. • Place herb in a little muslin bag allowing it to float gracefully in a quart of cold water. • Let soak in cold water 20 minutes up to overnight. Dip and squeeze! And drink…it tastes better than it looks! DECOCTION – used for extracting more dense plant material i.e.) roots and bark. Decocting simply means to simmer the plant gently in water for 15-20 min. • boil 1 quart of water. add 4-6 Tbsp. of herb/tea blend. • gently simmer with the lid on for 15-20 min. strain and drink. • Allow herbs to steep after decocting for a stronger brew. Refrigerate unused portion and reheat as necessary. • For Nutritive Teas i.e.. Daily Nourishing or Nurturing Tea: 3-4 cups daily.